This Admira is nice enough, but there's room for improvement. Some spec issues. No tuner. Admira proudly displays a 'hand-crafted in Spain' sticker on its headstocks and states that its "core" products are still made in Zarautz on Spain's northern coast. One of these core models, the Virtuoso, was originally offered as a non-cutaway electro - with solid cedar top and laminated rosewood back and sides - and has been a key guitar in Admira's line for some time. Today, it's only offered as a cutaway electro in full-depth EC version (£625) and, as here, in a thinline variant, designed for any player who wants a flavour of the nylon-string without pursuing the pure classical route. Like many modern Spanish-made guitars of this type, it's a factory construct and veers away from traditional classic construction - not least with a standard steel-string-like laminate neck block. However, typical classic traits still abound with the 650mm (25.6-inch) scale length, tidy tie-block bridge, slotted headstock with gold-plated classical-style rollers, a flat rosewood fingerboard with no face or side dots and a generous nut width of 52.63mm and bridge spacing of 58mm. Typically, the African mahogany neck is three-piece with no truss rod, but what looks like a central rosewood strip reinforcement. Outwardly, the work is pretty sharp, although finishing does seem a little over-thick and shiny. Internally, the fan bracing and unkerfed lining and struts are all clean enough, too. The thin body is a relatively new addition to the nylon-string canon and, here, our 75mm (as opposed to 105mm) depth makes for a much more comfortable player compared with our well-used and at least 15-year-old Virtuoso E.
Aside from comfort, you'd expect less feedback problems on stage with the reduced depth of the body. If our Virtuoso E with its finish-stripped top sounds like a cannon, this contemporary model is more demure. With a lower-than-concert classical string height (3mm on the treble side, just under 4mm on the bass, measured at the 12th fret), it's a good, if not exceptional player. Powering comes from a Shadow under-saddle and side-mounted Four Plus preamp with volume, four-band slider EQ (bass, mid, treble and brilliance), plus a pre-set EQ, phase switch and low-battery indicator. 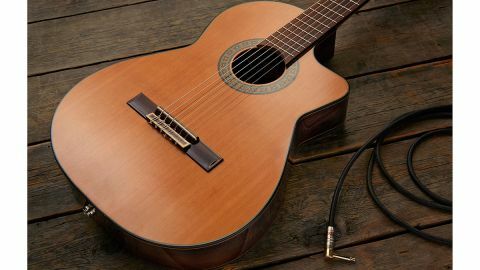 Plugged into an AER Compact Classic combo, there's little trouble getting a credible sound - although sweepable mids may be more helpful than both treble and brilliance on a nylon-string like this, not to mention a tuner. The EQ preset creates a bright flamenco-esque sound, but with that bypassed (by trimming the quite dominant bass end and dipping some mids), we get into the right ballpark, although it's the lower mids that are a little clouded and the real low deep bass that needs to be trimmed if you're plugging into a bigger PA.
With a very much par-for-the course feature set and competent build, this Admira is a fine choice for a serious entry into the nylon world for the practising and performing player. The actual preamp seems a little old in spec and with no tuner - very handy for nylon strings, especially when new - and it faces stiff competition from Chinese-made brands, not least Yamaha's NCX and Cordoba's extensive range. The trimmer depth, in our experience, does have value on stage to limit troublesome low end and also in terms of playing comfort, but a soundhole bung is probably as useful in louder onstage environments and really should be included here.